Student Mays Al-Dulaymi improves gene therapy techniques(Photo Credit: Dave Stobbe for the University of Saskatchewan). A USask researcher has developed compounds for delivering gene therapy that are 20 per cent less toxic than ones used currently, and are more compatible with the body. 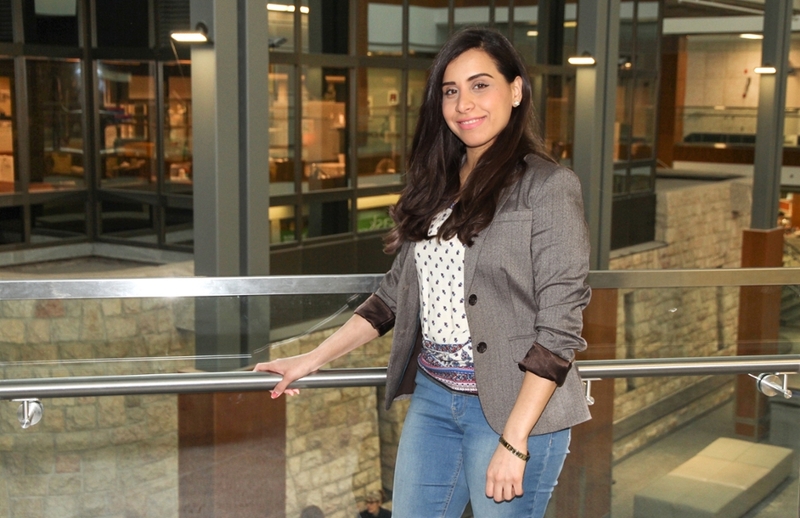 University of Saskatchewan pharmacy post-doctoral researcher Mays Al-Dulaymi is developing a tiny chemical compound that holds promise for improving gene therapy for skin cancer and other genetic skin disorders. One of the deadliest skin cancers, melanoma may be caused by overexposure to ultraviolet radiation from the sun or artificial sources such as tanning beds and sunlamps. The Melanoma Network of Canada reports that lifetime risk for developing melanoma has increased to one in 63 people today – – up from one in 1,500 in the 1930s. “It is paramount to find new treatments,” said pharmacy professor Anas El-Aneed, Al-Dulaymi’s co-supervisor. Gene therapy inserts genes into a patient’s cells instead of using drugs or surgery for treatment. Currently used only for untreatable illnesses, gene therapy is still highly experimental because there is a lack of chemical compounds that can deliver genes efficiently and safely into cells. Al-Dulaymi has developed nanoparticles — chemical structures 1,000 times smaller than a cross-section of a human hair — that may more efficiently and safely carry genes into cells. “Gene therapy is better than traditional treatments and holds so much promise because it allows us to treat the cause of the disease and not just the symptoms,” said pharmacy professor Ildiko Badea, Al-Dulaymi’s co-supervisor. 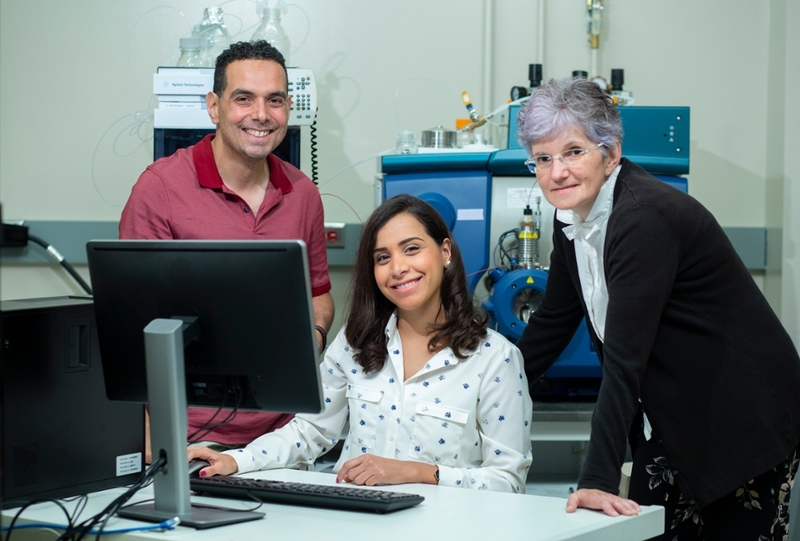 Al-Dulaymi has tested her 22 new nanoparticles, called gemini surfactants, and found that they are eight times more effective at delivering genes than older generation gemini surfactants studied in previous research. She has also found evidence that the compounds are safer to use because they are 20 per cent less toxic than ones used currently, and are more compatible with the body. She is the first to use a mass spectrometry technique to study both the composition of the compounds and their distribution on skin tissue. After applying the compounds on mouse skin tissue, Al-Dulaymi put the samples into a machine that simulated the human skin to test how deeply the compounds penetrated. Her results are published in Bioconjugate Chemistry and the Journal of Pharmaceutical and Biomedical Analysis. The next step is to study the efficacy of the treatment by testing the nanoparticles on live mice with melanoma. Results are expected in the next few years. “We need more research before Mays’ compounds could be used for gene therapy – maybe around 15 years from now,” said El-Aneed. The reputation of the U of S as a top research institution is what attracted Al-Dulaymi from Iraq. Her research is funded by the federal agencies Natural Sciences and Engineering Research Council (NSERC), Canada Foundation for Innovation (CFI), Canadian Institutes of Health Research (CIHR), and the pharmaceutical company Apotex Inc.
Federica Giannelli is a graduate student intern in the University of Saskatchewan research profile and impact unit.